How to Clone Hard Drive to New Hard Drive in Windows 8 without Reinstalling System and Applications? Learn the method to clone hard drive Windows 8 with free software without operation of reinstalling system or applications easily and safely. If you prepare to upgrade your Windows 8 hard drive, you firmly would clone the previous drives completely at first. What's worth mentioning here is the files in the system partition can not merely be dragged to a new partition, because by doing like that, perhaps you can not start your computer normally. Therefore, capable third party clone software plays a significant part here. 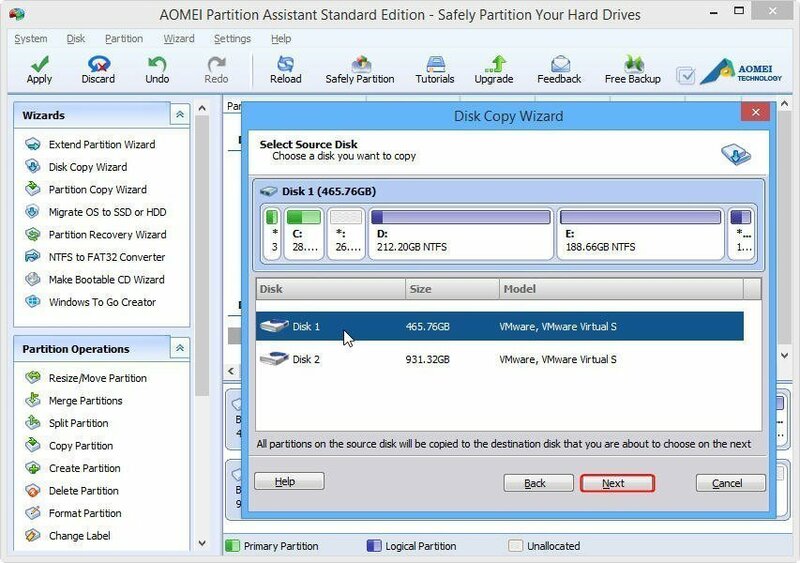 As a magic partition tool, AOMEI Partition Assistant Standard is strongly recommended to aid you clone hard drive the system partition as well as other partitions. Moreover, it has other powerful features, such as, Resize Partition, Merge Partitions, Split Partition, and more useful features. With the increase of the user need in cloning the partition and cloning a previous hard drive to a new one, nearly all of the partition software has the clone feature now. 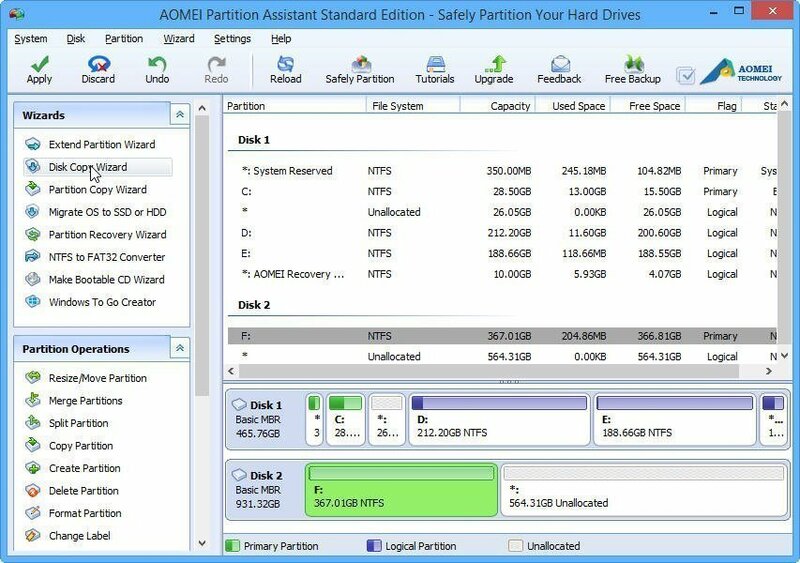 Some of the software is not free of charge, but free software-AOMEI Partition Assistant Standard can help you resolve the clone partition task securely and freely. Moreover, it has two options for you to reach the goal, "Copy Disk Quickly" and "Sector-by-sector Copy". You can choose either of them based on your need. In addition, it works with both 32 bit and 64 bit version of Windows 8, Windows 8.1 and Windows 7/Vista. As what has been mentioned above, different clone method has different requirement on the unallocated space. 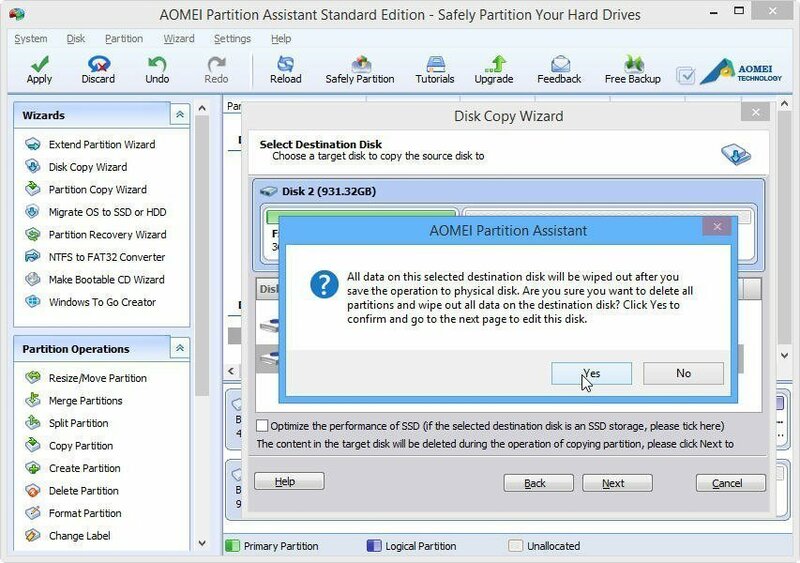 AOMEI Partition Assistant Standard offers you with two ways to clone disk in Windows 10, you can choose the suitable one depending on the size of unallocated space on your destination disk. Copy Disk Quickly: The size of the unallocated space must be equal or larger than the size of the used part in the source drive. Sector-by-sector Copy: The size of the unallocated space must be equal or larger than the size of the source drive. Notes: when you clone the disk that has the system partition, the operation will be completed automatically by the computer under the PreOS mode (restarting mode). Next, it is an example of cloning Disk 1 (source disk) to Disk 2 (destination disk). 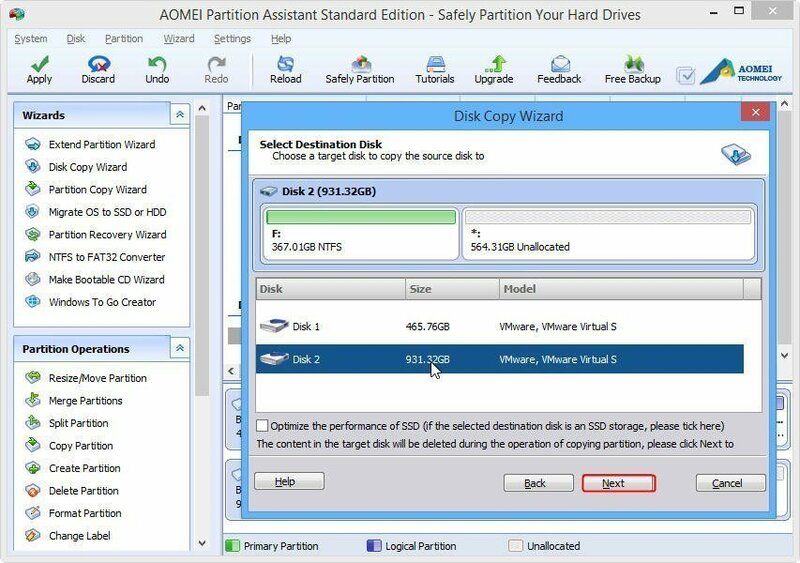 Step1: Install and launch AOMEI Partition Assistant Standard. And then, click "Disk Copy Wizard" in the left panel. Step2: Choose Copy Disk Quickly and then click Next. Step3: Choose the source disk (Disk 1) and then click Next. Step4: Select Disk 2 as destination disk, and then click Next. Step5: Make sure you have set the entire things right, click Yes. AOMEI Backupperwhich enables you to backup system/files/partition is alsois also fully compatible with Windows 8.1, Windows 8 and Windows 7/Vista and the steps of cloning hard drive in Windows 8.1 are the same as those to clone Windows 8 hard drive. Apart from the function of clone disk, AOMEI Partition has many other functions, so download AOMEI Partition Assistant Standard Edition and check it out. 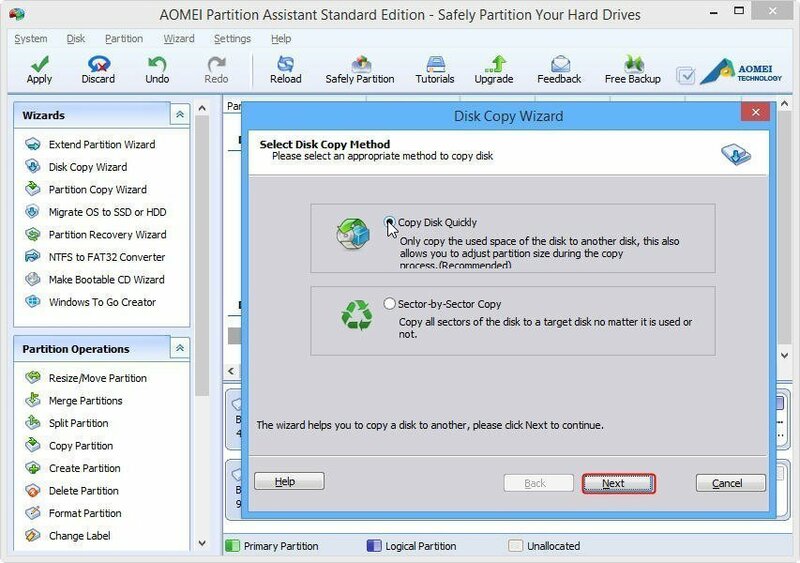 How to clone partition in Windows 8 or 8.1? How to extend system partition for Windows 8 or 8.1 easily?